Elevate your on-the-job productivity. Proven HP PageWide Technology¹ consolidates monochrome and color printing, as well as scanning and copying, for enterprises. Fast, quality document production keeps the focus on moving projects forward. 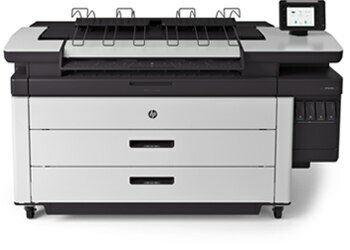 ¹ Proven HP PageWide Technology powers HP Inkjet Web Presses—currently producing 4 billion impressions monthly—and HP X series business printers. ² Fastest based on alternative low-volume LED printers and MFPs (under 7D/A1 pages/minute) as of April, 2015. Operational costs based on low-volume LED technology under $20,000 USD in the market as of April, 2015. Operational costs consist of supplies and service costs. For testing criteria, see hp.com/go/pagewidexlclaims. ³ Compared to prints produced with HP 970/971/980 inks that are fade and moisture resistant per ISO 11798 Permanence and Durability Methods certification. For testing criteria, see hp.com/go/pagewidexlclaims. ⁴ ISO/US technical and offset standards include American ANSI and Architectural page size standards, ISO A technical document standard, and ISO B offset page size standard.